En cas de besoin, vous pouvez utiliser Google Translate pour obtenir une traduction automatique. We had 12 outstanding winners of the 2013 Lush Prize Awards sharing prize money of £250,000, plus one Special Award. They include researchers in university departments from Cardiff to Innsbruck and campaigners from the USA and Sweden. Joint Winner: QSAR and Molecular Modelling Group, Liverpool John Moores University. For their work developing computational alternatives to animal testing to predict the effects of chemicals. For their work developing non-animal replacement models of the human respiratory system for inhalation toxicology applications. Accepted by Zoë Prytherch, in vitro toxicologist for the LPRG. For providing training in ethically sound and scientifically advanced human cell culture research technologies. For the development and delivery of training courses in animal-free cell culture research in accordance with EU regulation. 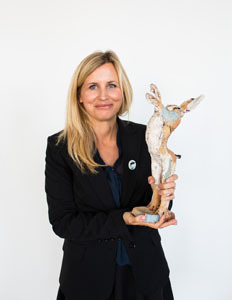 Joint winner: The International Council on Animal Protection in OECD Programmes (ICAPO). For their successful work with the OECD, now a world leader in the promotion of non-animal methods, approaches and policies. Accepted by: Kristie Sullivan director of regulatory testing issues at the US-based Physicians Committee for Responsible Medicine (PCRM) and coordinator of ICAPO activities. For their work with Swedish regulators to replace animal testing. To celebrate the European ban on the use of animals in the testing of products for cosmetics purposes earlier this year. Policy Director, Research & Toxicology Department, Humane Society International/Europe. Now in its second year, the annual Lush Prize has seen a more than 40% increase in nominations from science projects.